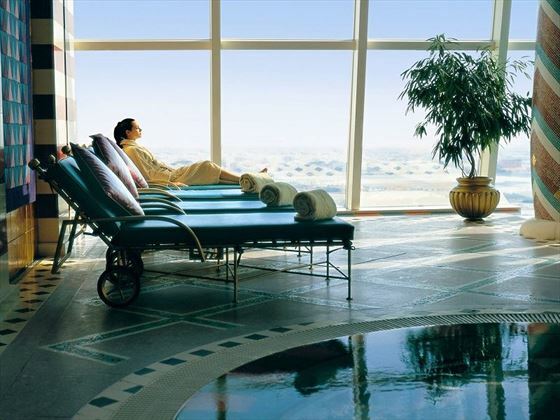 Burj Al Arab Jumeirah has long been recognized as one of the finest hotels in the world offering luxurious experience. Rising on a man-made island soaring to a height of 321 metres, dominating Dubai’s coastline. The all-suite hotel offers 202 luxury duplex with the stunning views of the Arabian Gulf, providing exceptionally personalized service, with an impressive eight colleagues to every suite. Towering 27 double-height storeys high, the hotel comprises of a choice of one, two and three bedroom deluxe suites; Panoramic and Club Suites; the Presidential Suites and the two Royal Suites that extend over the 25th floor. 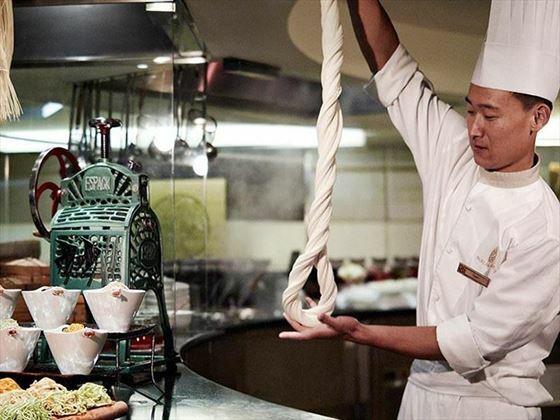 The hotel offers 9 best dining venues, from authentic Arabic cuisine to Far East Asian and Modern European dishes including the highly acclaimed Nathan Outlaw at Al Mahara and Al Iwan offering Arabic buffet. The Terrace is a remarkable venue offering hotel guests and Burj Al Arab members the finest Arabian hospitality. It is home to Scape Restaurant & Bar; a vibrant and chic venue serving Californian fusion cuisine and an eclectic mix of signature beverages, two stunning pools, dedicated butler-serviced cabanas, and a beach area with luxury day and sunbeds. Bathed in natural light, the spacious Talise Spa is housed over two levels with Talise Fitness offering a sanctuary for guests to indulge in an extensive menu of pampering treatments where both men and women relaxation areas feature an aqua retreat. In addition, a healthy menu of nourishing cuisine can be enjoyed in the relaxed setting of the Assawan Amphitheatre. 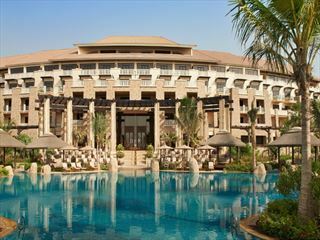 This luxury hotel is nestled on an island just off the picturesque Jumeirah beach, and only a five minute walk from the lively Wild Wadi Waterpark™. Its secluded location on a small island adds to its exclusive atmosphere. Deluxe One Bedroom Suite – Delightful 170sqm suites, with two levels overlooking the sea. Sleeps a maximum of two adults and three children. 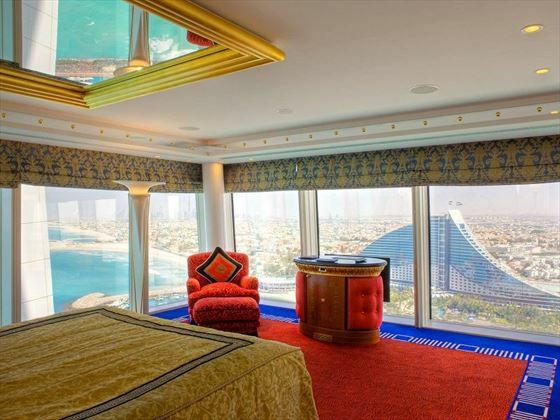 Panoramic One Bedroom Suite – Beautiful 225sqm, two-level suites overlooking the sparkling Arabian Gulf, featuring one bedroom with bright, regal décor. Sleeps a maximum of two adults and two children. Deluxe Twin One Bedroom Suite – Gorgeous 170sqm suites, featuring one bedroom with two twin beds, looking out to the sea. Sleeps a maximum of two adults and three children. Deluxe Two Bedroom Suite – Decadent 335 sqm suites perfect for large families. The two levels features beautiful ocean views, two loungers, two ocean-view bedrooms, a dining room, two master bathrooms, a private bar and butler’s kitchen. Sleeps a maximum of four adults and three children. Royal Two Bedroom Suite – A magnificent 780sqm suite with luxurious décor and amenities, including a private lift and cinema. 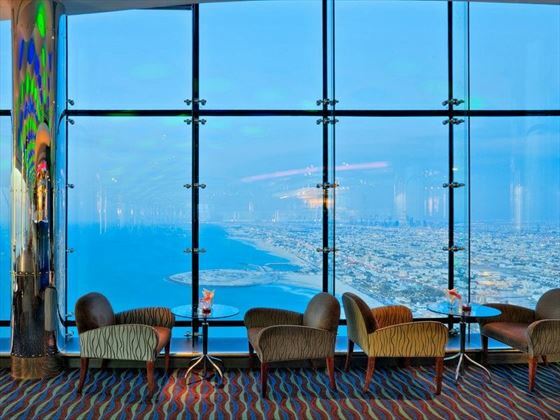 Both levels have unsurpassable views of the Arabian Gulf, and lots of natural light. Sleeps a maximum of six adults and three children. 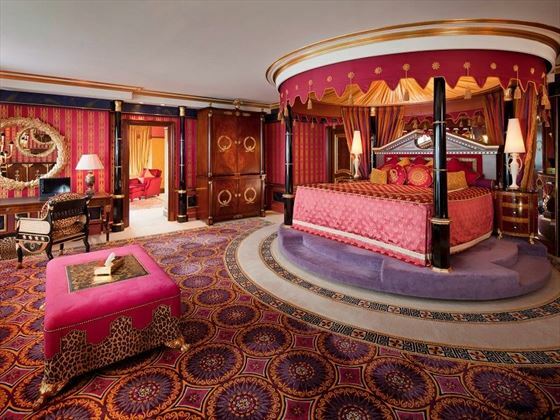 Club One Bedroom Suite – This 330sqm suite is incredibly indulgent and exclusive. Featuring a spacious bar, a snooker table, and exquisite views. Sleeps a maximum of two adults and three children. Presidential Two Bedroom Suite – This 667sqm, two bedroom suite is simply incredible and lavish, featuring floor-to-ceiling windows on both floors, a pre-function area, two lounges, two bar areas, his and hers dressing rooms, and a private dining area. Sleeps a maximum of four adults and two children. Diplomatic Three Bedroom Suite – A luxurious 670sqm three bedroom suite nestled over 150 metres above the sea, featuring a pre-function area, a private bar, three lounges, and a private dining space for eight. Sleeps a maximum of six adults and three children. 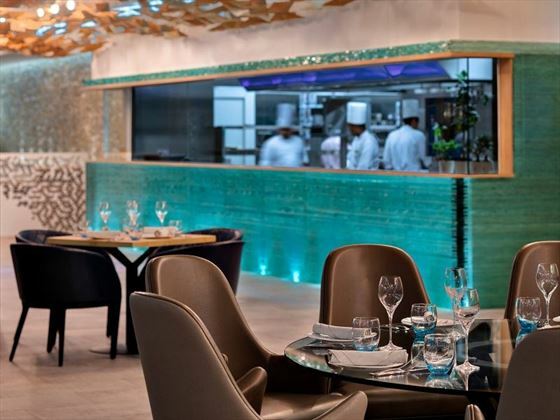 Nathan Outlaw at Al Mahara – A decadent fine-dining seafood restaurant created by award winning chef Nathan Outlaw, specialising in a simplistic cooking style and fresh produce. 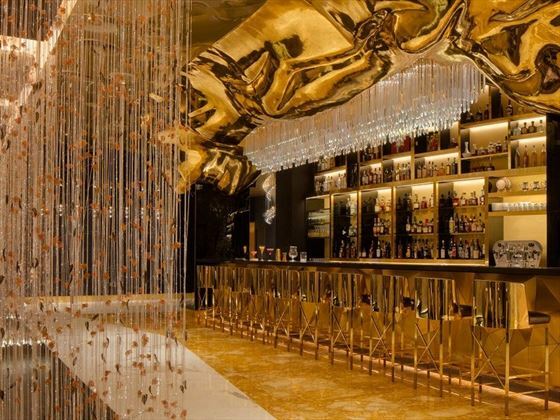 Scape Restaurant & Bar- A chic restaurant and bar serving up delicious Californian fusion cuisine and signature drinks. Gold on 27 – A sophisticated lounge bar serving an incredible array of premium drinks and crafted cocktails, mixed with tasty bar snacks. Al Iwan – Fine food is prepared with quality ingredients, drawing together classic cooking techniques with the very finest seasonal food for a real taste of Arabia. Al Muntaha – Located on the 27th floor, this classy restaurant has phenomenal views, served with seasonal, international cuisine. 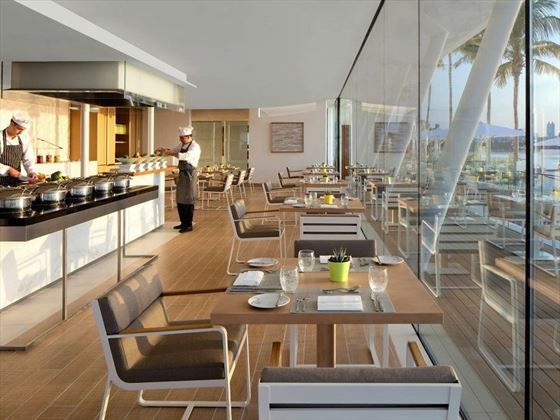 Bab Al Yam – Located amidst lush landscaped gardens and alongside Burj Al Arab’s private sundeck, this café-style restaurant offers a varied international buffet. Junsui – Have a taste of Far East Asia delights at this stylish dining room and cocktail lounge. Sahn Eddar - The distinctively stylish setting at the base of the world’s tallest atrium provides the perfect backdrop to enjoy morning coffee or afternoon tea. SkyView Bar – Soaring 200 metres above sea level, this is a wonderful spot to enjoy a cool drink. Talise Spa – an utterly beautiful spa bathed in natural light, offering a wonderful sanctuary to relax and revitalise the mind, body and soul. There are two floors, each featuring male and female relaxation areas, infinity pools, Jacuzzis, treatment rooms, saunas, steam rooms and plunge pools. There is also a couples’ treatment room should you and your partner fancy unwinding together. Sinbad’s Kids Club – fantastic for children aged 1-12, offering days full of fun including playing in the spacious playroom filled with soft toys, board games, bean bags, and a large plasma screen with the Disney Channel. There are also computer games, books and creative activities, plus a quiet bedroom should a guest feel tired. 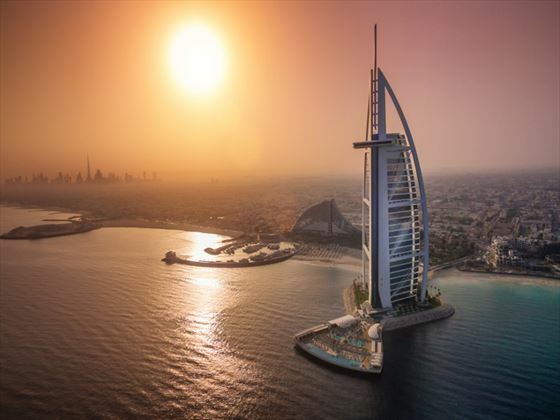 Burj Al Arab Jumeirah guests are now welcome to enjoy complimentary access to Summersalt Beach Club, located at Jumeirah Al Naseem, the latest addition to Madinat Jumierah which is open daily from 08.00 to 23.30. 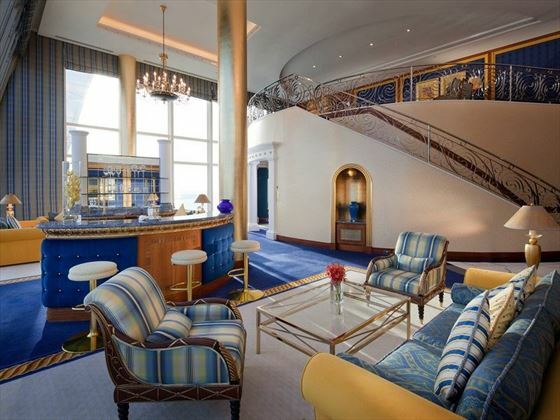 In addition, guests can still enjoy unlimited access to Burj Al Arab Jumeirah Terrace. 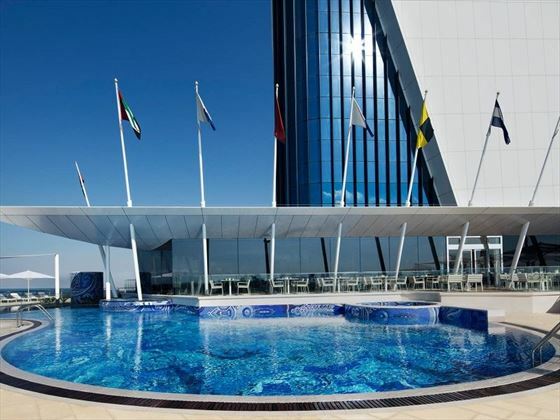 Stretching out 100 meters into the Arabian Gulf, this master piece of innovation which was built in Finland over 8,000 nautical miles away, boasts 2 swimming pools, 32 luxury cabanas as well as a restaurant and bar. 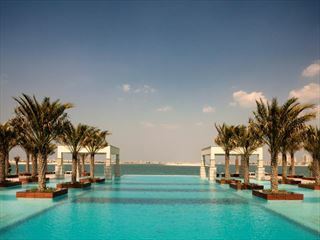 The guests can also indulge in a luxurious experience with the 32 fully air-conditioned cabanas overlooking Burj Al Arab Terrace, Palm Jumeirah, and the Dubai skyline. The 24 Cabanas can accommodate up to two guests while our eight Royal Cabanas can accommodate up to four people. Alcohol will not be served in Bars, Restaurants and Hotels.Non-Muslim holidaymakers do not have to follow these traditions, however, hotels in Dubai do impose certain restrictions on alcohol, food consumption and entertainment between sunrise and sunset. Some bars and restaurants within the hotel will closed during this time.